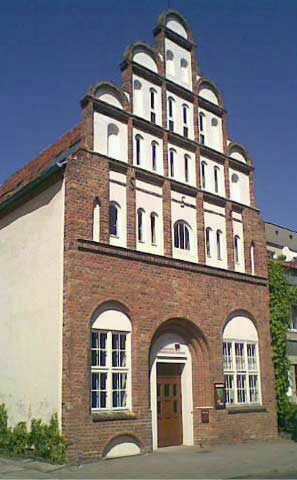 The house in the Brüggstr.5 was built in 1530 as a resident and storehouse on the foundations of an older building. About a ground floor hall with lateral gallery three storage shelves were built. The facade has some typical features of a Renaissance building. The house was in the 17th century, a false ceiling and new window openings on the ground floor and what rebuilt several times in the 18th and 19th centuries. It served Craftsmen and Merchants (sailmaker, Gerber, pastry chef, restaurateur, carpenters, etc. ) as a residence and workplace. In the 20th century the house was home to a general store. Then it what demolished in the years 1978-1982 due to disrepair and rebuilt with the original Renaissance building modeled facade.